Hahnemuehle Varnish is used to add a robust protective coat to canvas prints. This coating increases overall longevity and guards against environmental factors such as humidity and water. 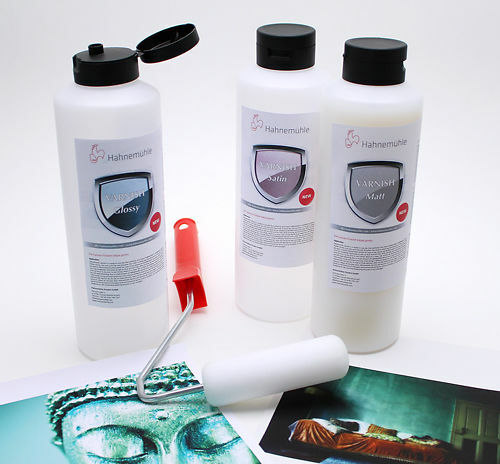 The Hahnemuhle varnish will also protect your canvasses from cracking and preserve the colours from fading. The varnish comes in three different coatings, allowing you to choose the type of finish – matte, satin or gloss. The varnish is clear so will not significantly change the actual colours in your print - but will add richness to the blacks and enhance the vibrancy in the colours. For the best results we recommend using the Hahnemühle varnishes on a matte canvas and deciding how glossy the final print will be by selecting the appropriate coating. While the matte finish doesn't leave the print identical to an uncoated print, it is the closest you can get to the original canvas whilst still gaining the benefits of the coating. Application is easy using a foam roller. It's a self settling product. Do not use a standard paint roller. Of course only an actual test can determine what exact affect a particular coating will have on a print made with a particular canvas and ink combination, so ensure you test your canvas/ink/varnish finish combination thoroughly before applying to an important print. Hand curated articles, links and downloads to help you get the best from your Hahnemühle Varnish 1 Litre. Hahnemuhle's detailed instructions for application.